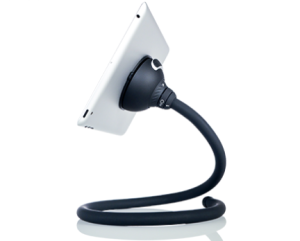 Turn your tablet into a hovering, hands-free device anytime, anywhere with the Octa Monkey Kit which includes the flexible Monkey Tail and a Vacuum Dock that holds up tablets and connects to the tail. Users can prop, wrap or hang the Monkey Kit for a variety of tablet viewing angles—in the bed, on a couch or from a desktop. Currently, the Denver startup is also running a Kickstarter campaign to add more tablet accessory components to its customizable tablet holder system—with a few hours left to go! Tablet users will have more options to create a tablet mount or holder that works best for them with the launch of Octa’s newest modular components.